BMC Hosting Review 2019: Is BMC Hosting a Good Hosting? BMC Hosting is an American website hosting and website solutions provider. They offer simple packages with the option to purchase add-ons as required. Founded in 1996, BMC Hosting is an American website hosting provider with physical servers in a Tier III data center plus a cloud-based platform in a Tier IV datacenter. They do not advertise how many customers they have, but they do say that they service clients in America and worldwide. Their website and support are available in English. BMC Hosting is a full-service website hosting provider. They offer shared hosting, dedicated servers and colocation, and search engine optimization (SEO) services. Unlike lots of other companies, BMC Hosting is very specific with its inclusions. They do not offer unlimited website hosting, and instead, they offer one package with 6 GB of disk space and 10 GB data transfer per month. If you require more, you can pick and choose from the available add-ons including (but not limited to) domain names, SSL certificates, full backup on flash drives, extra bandwidth, and extra disk space. You can then choose to bundle the website hosting package with email and/or website statistics. Whilst the add-ons are all at an extra cost, you can start with a base product and customize it as required so that you don’t purchase more than you actually need. BMC Hosting comes with one-click installers for popular programs including WordPress, Joomla, Drupal, and Mura, along with a choice of control panels from Helm, Plesk, and BMC’s own cPanel. Also, at an extra cost, you can purchase ColdFusion (a rapid application development platform) and CFML (the programming language). Unfortunately, BMC Hosting is relatively expensive when compared to American competitors. 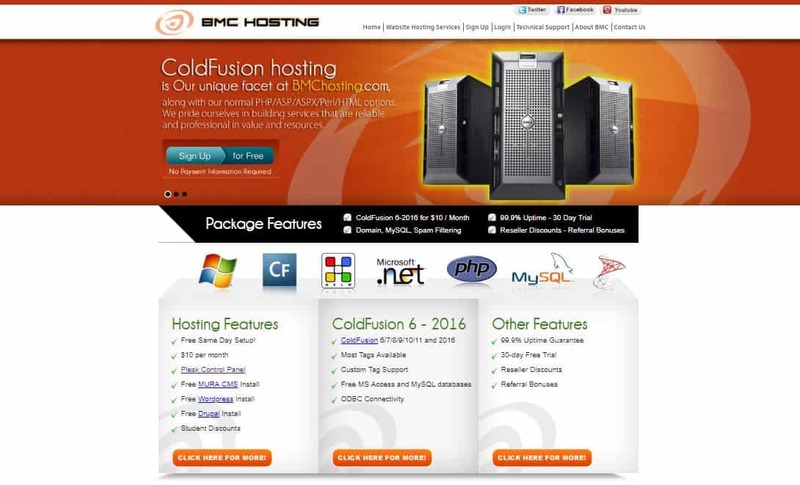 But if you’re looking for a choice of cPanel, ColdFusion by Adobe, or you like the no-nonsense package inclusions, then the small extra cost may well be worth it. They offer two pricing terms, monthly and yearly, and it is cheaper if you purchase the annual plan upfront. They also offer a 30-day money-back guarantee, reseller discounts, and referral bonuses. There is no free trial or freemium plan. You just need to consider the costs of the add-ons. Domain registration, SSL certificates, ColdFusion, extra bandwidth, extra disk space, and email spam protection are all charged at an extra monthly fee. Whilst not overly expensive, you need to build these costs into your calculations. BMS Hosting offers technical support by telephone, email, and a ticketing system. They do not have live chat available, and they do not clearly advertise their customer support opening times on their website. Ideally, I would prefer to contact them via live chat on their website and to know exactly when I can do so. They do have a comprehensive knowledge base on their website, as well as a monitored Facebook page with Messenger. I have received quick, helpful and informed responses via Facebook messages. The operator was very polite and able to answer my questions easily. BMC Hosting is a well-established website hosting provider. They work in many verticals including website hosting, website marketing services, and pre-paid credit cards and e-commerce solutions. Wondering how BMC Hosting stacks up against other Web Hosting companies? Enter any other Web Hosting company and we will give you a side-by-side comparison.